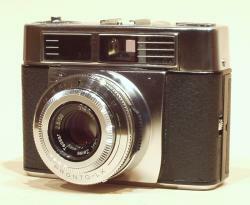 The Contessa LKE is a nice rangefinder made by Zeiss Ikon from 1962 to 1966. Under a debatable design the Contessa LKE hides a nice, easy to use rangefinder. Made by Zeiss Ikon from 1962 to 1966, the Contessa LKE is built around a 50 mm f/2.8 Carl Zeiss Tessar. The shutter is a Pronto LK giving speeds from 1/500 s to 1/15 s plus B pose with flash sync at all speeds. The clear viewfinder displays a collimated frame with parallax marks along with the coupled light meter and rangefinder. The light meter is also displayed on top of the body. The film rewind lever is located under the body. The frame counter must be reset manually. The Contessa LKE works without any battery : the shutter is mechanical and the selenium light meter is powered by the light itself, unfortunately making it unefficient in low light conditions. Its good build, ease of use and features make the Contessa LKE a very usable camera. The LKE-B, built from 1966 to 1968, had a flash hot shoe.